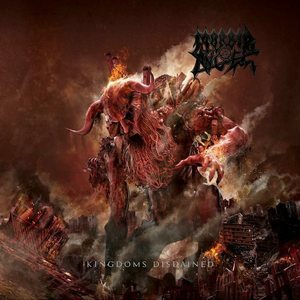 Morbid Angel have returned with Kingdoms Disdained, their first new album in six years. Much has happened with the band during that time. The response around their last album Illud Divinum Insanus was so bad that it is almost a wonder that they are still going to be releasing new music. At this point, vocalist David Vincent is gone again only to be replaced once more with former vocalist Steve Tucker, who also handles bass duties. Guitarist Trey Azagthoth is the only member left from the last album, with Scott Fuller (Annihilated) on drums. So when it appeared that Morbid Angel was recording new material with Tucker, I would say the expectation level for the new record was considerably low. This is not to knock anything Tucker has done in the past, it is merely a reflection of how bad their most recent full length was. Tucker worked with the band at the latter end of the ‘90s and the early ’00s with three albums to his credit. Kingdoms Disdained sounds a great deal more like Covenant with its slower paced grooves and clearly different than what Altars of Madness was. Admittedly I had not listened to Tucker-era Morbid Angel before this and it has intrigued me in a way that Dio-era Black Sabbath did because I was of the belief that only Ozzy could voice that band much like David Vincent prior to this. All in all, Kingdoms Disdained is a solid death metal album and one that allows the band to rewrite their own history because they are better than what they had been doing prior to Vincent’s most recent exit. With so many outstanding albums from veteran bands, 2017 is a tough year for a band make a dent in death metal, even one so well established as Morbid Angel. Nonetheless, the fan reaction so far is indicative that this is what they were waiting for all along. Going forward let’s see what Morbid Angel have up their collective sleeves after almost 35 years of doing this.